There are some things you just don’t want to actually talk about, but you still really need to know. Cleaning up mouse droppings is one of those things. Thank you Internet for providing a judgment free place to look up all the things you’re too embarrassed to actually ask someone. 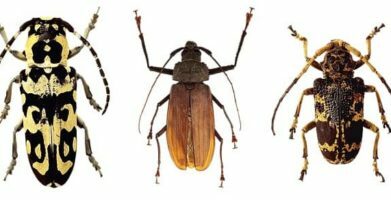 Before we get down to the nitty gritty, let’s talk about what mouse droppings are and why they matter. “Mouse droppings” refers to rodent excrement. Yes people, we are talking about poop. You do it, I do it, mice do it. You and I have the decency to use a toilet and flush after the fact but mice will leave their rice sized and shaped black pellets everywhere they go. That is gross enough all by itself, but the matter becomes significantly more serious when you consider the dozens of diseases mice can transmit to people ranging from salmonella to hantavirus. Why should you care about mouse poo? nests: any gathering of soft materials such as shredded paper, cloth, or furniture stuffing; usually found in areas that aren’t frequently disturbed, or near a heat source. Mice droppings measure 1/8 to 1/4 inch in length and have a thin, rod-shaped appearance with pointed ends. Roof rats are larger than mice but smaller than Norway rats. Their droppings tend to measure 1/4 inch long. Droppings of Norway rats can measure between 1/4 to 1/2 an inch in length and have a moon or crescent shape. While you may be inclined to get out your vacuum and make the nastiness disappear quickly and without any direct contact, that is ill-advised. The CDC offers detailed guidelines for cleaning up after a rodent infestation. 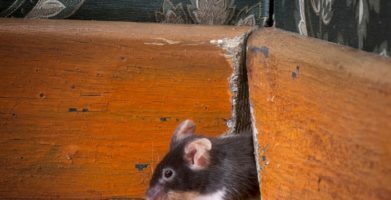 Taking special precautions when cleaning up mouse droppings is important because many of the diseases rodents can carry may be transmitted through their droppings. 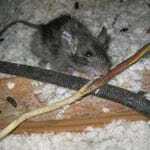 Don’t use a broom or vacuum when cleaning rodent infested areas. This could stir up pathogens and cause you to inhale them. Don’t use your bare hands when cleaning up mouse droppings. Don’t forget to rodent proof the area to prevent future infestations. Do air out the area prior to cleaning to reduce the chance of inhaling air borne germs. Do wear rubber or latex gloves. Do dispose of all nests, droppings, dead rodents and soiled paper towels or cloths in a sealed bag inside a covered trash can. There are some things you just don't want to actually talk about, but you still really need to know. Cleaning up mouse droppings is one of those things. Thank you Internet for providing a judgment free place to look up all the things you're too embarrassed to actually ask someone. Before we get down to the nitty gritty, let's talk about what mouse droppings are and why they matter. "Mouse droppings" refers to rodent excrement. Yes people, we are talking about poop. You do it, I do it, mice do it. You and I have the decency to use a toilet and flush after the fact but mice will leave their rice sized and shaped black pellets everywhere they go. That is gross enough all by itself, but the matter becomes significantly more serious when you consider the dozens of diseases mice can transmit to people ranging from salmonella to hantavirus. nests: any gathering of soft materials such as shredded paper, cloth, or furniture stuffing; usually found in areas that aren't frequently disturbed, or near a heat source. Don't use a broom or vacuum when cleaning rodent infested areas. This could stir up pathogens and cause you to inhale them. Don't use your bare hands when cleaning up mouse droppings. Don't forget to rodent proof the area to prevent future infestations.